has been converted into web based format. working in a telescope making workshop, including common problems and their corrections. I wanted a picture to go with the disk that would capture as many of the aspects of the Dobson style telescope as possible. Since these telescopes are often used for star parties at schools I knew there should be people of various ages in the picture. I have been attending the ‘Music of the Spheres’ summer concerts at Lick Observatory for many years and it occurred to me that the early days of Lick Observatory were coincident with the French Impressionist Movement in France. This connection has never been made before so far as I know. One of the Impressionists Artists was Georges Seurat. Paintings by Seurat were created by the use of tiny dots of paint on the canvas. This was known as ‘Pointillism’. Colors displayed in this way are additive, unlike mixed paint pigments. Colors of green and blue add to cyan rather than subtract to blue green. Red and green add to yellow rather than subtract to brown. The equivalent of this painting using a computer is ‘pixel’ painting. A photograph scanned into the computer is presented with pixels. The more pixels per centimeter and the more possible colors per pixel the better the reproduction can be. Oh, but we know that the Impressionists were able to paint beautiful pictures using relatively few points of paint and sometimes with only two or three colors. So then it should be possible to paint beautiful pictures on a computer screen with few pixel and few colors. Needing some starting point, I loaded my 12 inch telescope and my Polaroid Camera into the truck for the trip to the concert. The picture taken by one of the other guests shows me looking through the scope. I took some care that the sun would not strike the mirror as the cardboard tube would have been set afire very quickly. This photo along with a second showing the distant coast range mountains in the background supplied the model for the background and for the person at the telescope (me). A week or so later it was off to the library to look at books of French Impressionist painting. 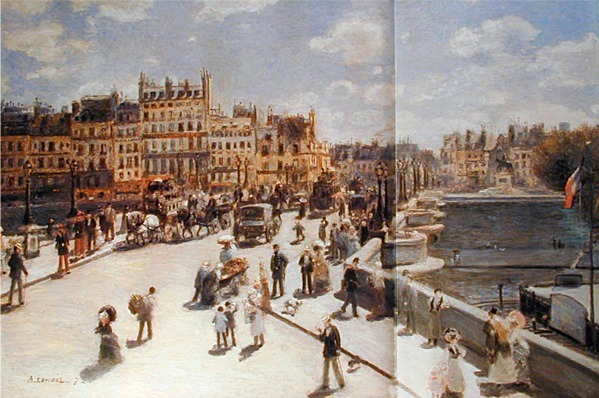 I found the two boys in the Paris Street Scene by Renoir. Is the Boy explaining the size of the Eiffel Tower, stretching bubble gum or pointing to some object on the celestial sphere? I prefer to presume the latter. The lady in green was another Renoir. Originally in white she was far too large and had far too many pixels. The Little Girl in blue is in the far ground of a painting by Toulouse Lautrec. Try as I may I am unable to find this painting again. The picture took about two months plus another two weeks fussing with the animation and the late twilight version. The pattern on the paving was originally a checker board. While stretching a caricature to fit I noticed the interesting pattern and adopted it. I have noticed that the paving pattern can be distinguished from the checkerboard on the telescope from some distance. I attribute this gain of resolution to the difference in the diffraction pattern caused by the different spatial frequencies of the two patterns. The Astronomer is carrying a red flashlight or laser pointer which seems to be blinking on and off. The Lady seems to be walking away, I don’t know why. The Little Girl seems to be telling the Lady to return to look at the Croissant Venus. Return to 'Table of Contents' page. There are five other animations in the .gif picture. Three are on the ground, two are in the sky. In the twilight version the twinkling of the street lights in the Santa Clara Valley are the only animation. Paint programs such as LView are able to combine and separate the frames of these .gif animations.